I have never claimed to be a photographer. 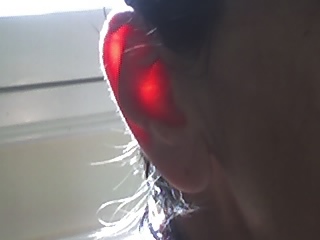 But the other morning I was combing my hair after the shower when suddenly I observed the sun shining through my right ear in such a way that I seemed to have a burning ember attached to my skull! The rest of me was the same dull opaque bag of flesh and bones as always, but my ear! My ear was like a fragment of stained glass! My ear was on fire! In my ear, blood blazed and flamed! These may seem a little silly, but to me, the following two examples are a source of great amazement to me. Tying our shoes. We're so used to it that it seems simple, but it is really a complex action. I bet if you looked at the programming behind a robot tying a knot or wrapping a twist tie on a bag of bread, there would be a LOT of code for it. Second, when I've taken a shower and am rinsing, I toss my cloth out of the shower into the sink across the room (so I don't forget it and let it sit in a moldering heap in the tub) and invariably, it lands just where I want it to go. No calculation. No code. Just a quick toss. A mini version of throwing a baseball toward a batter, or a basketball toward a hoop, or shooting an arrow toward a target, or playing the violin. On just the physical level, never mind the intellectual and spiritual levels, we are incredible creatures! What must our creator be like?! Thanks for sharing this, especially the lovely photo of your ear! Funny (and wonderful) that you should mention this today, Heather. Just yesterday, the setting sun turned my gunmetal eyes a startling cerulean in the bathroom mirror. The epiphany at the heart of this brief metamorphosis was realizing how little it had to do with me. OH!! I love playing this game: contemplating God in our biology and nature. Have you heard of Laminin? I think that's the name. Google: Cross in our bodies. 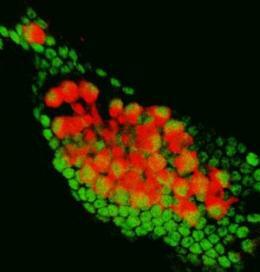 I love to contemplate our biological systems, especially the reproductive system and the conception of life. It really blows my mind. I also become mesmerized by nature: the water cycle, how the seasons can so brilliantly correspond to each individual souls spiritual journey and on and on. I remember reading about one of the saints, I believe it was St. Francis. He was contemplating God in nature(it must have been St. Francis) and he said, "OK, I hear you, stop screaming." I recently read this in a book by Fr. Jacques Phillippe, "God speaks with mankind, proposing a way of life, and awaiting a free response." and turn it into a gem. Sometimes I look at my feet and wonder how did those bones once lived through three inch heels (no more) and all the work outs which I still do-to a much lesser degree. be turned into a book.